The Purple Skull Helmet goes to any Legendary members until we run out. 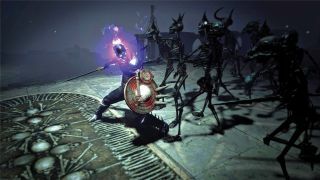 Path of Exile, which just launched its Betrayal update to a massive reception, remains one of the best free-to-play games around. Steven covered the update in detail back in November—it was described as "one of the biggest changes to Path of Exile since The Fall of Oriath added six new story chapters". We've got a little treat for PC Gamer Club members this week. Anyone signed up to the Legendary tier gets a key for the Purple Skull Helmet while stocks last—existing members got theirs yesterday. We'll send out to new members, too, while we have them spare. The helmet is a skin that turns any piece of equipped headware into a fetching magical skull that burns purple eternally. Enjoy.